Trim the bottoms of your asparagus and then bring a medium pot of water to a boil. While the water is coming to a boil prepare an ice bath for after the asparagus cooks. (An ice bath is just a large bowl filled with cold water and ice – this will stop the asparagus from cooking as well as help it to keep the vibrant green color). Once your water comes to a boil add the asparagus and cook just until the water comes back up to a boil (also known as blanching). 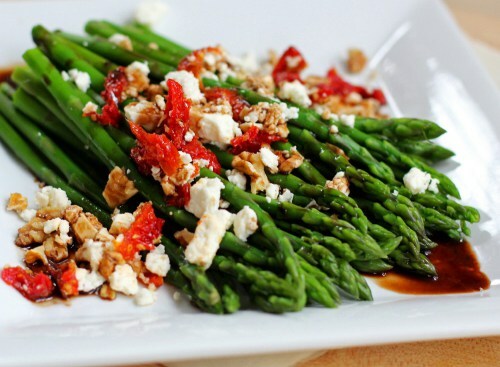 If you want your asparagus a little more on the tender side, leave it in for just a minute or two longer. Once cooked, drain and place the asparagus immediately in the ice bath. To finish, remove from water, drizzle with balsamic and other ingredients, season with salt and pepper as desired and serve.